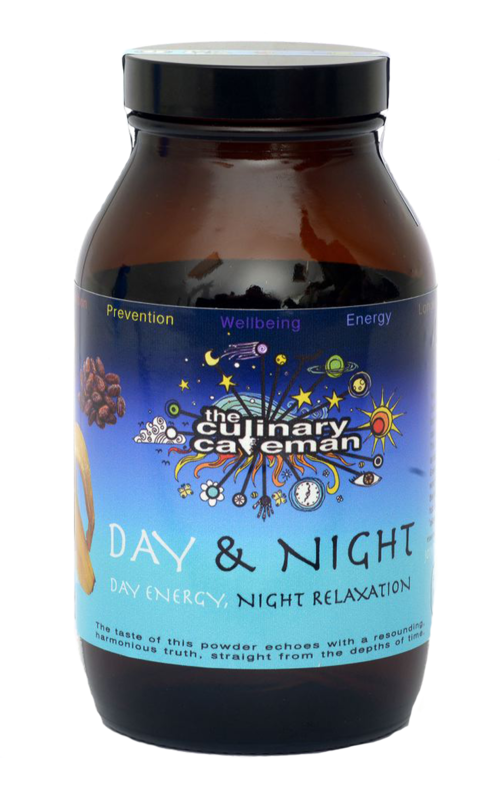 Day and Night has been formulated to help those who lack energy through the day and then have the added problem of not sleeping well. This powder has been hand-blended from only the best and purest ingredients, presented in a perfectly balanced and utilisable powdered mix, helping to Unlock the true power of Gaia. Dried at a very low temperature, so qualifies as a raw food, retaining as many of the nutrients as possible. These nutrients particularly aid the proper functioning of the hormone system as well as providing energy and an excellent range of nutrition. The formulation also helps with blood oxygenation, mental agility, concentration, stamina, insomnia, recuperation, stress and is a prebiotic feeding beneficial gut bacteria. Feeding the pineal gland with the required essential amino acids (notably tryptophan) to assist in the production of the hormone melatonin, promoting a beneficial sleep pattern (circadian rhythm). The hormone serotonin also requires tryptophan, helping with cognitive functioning as well as the regulation of mood and sleep. Day and Night focuses on these hormones. A delicious chocolate and fruit drink with added goodness the Aztecs and Mayans, with their reverence of cocoa would have been delighted with, as would have the ancient Egyptians, Greeks and Romans, all of whom considered figs sacrosanct. Protein, the Vitamins B6 and C.